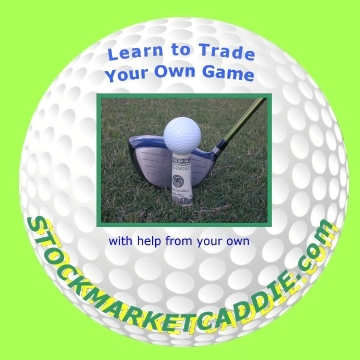 STOCKMARKETCADDIE.COM IS DESIGNED TO HELP MEN AND WOMEN DEVELOP "THEIR OWN GAME" AT TRADING STOCKS OR FUTURES FOR PROFIT. THIS SITE WAS BORN FROM A PERSONAL PASSION FOR FREE CAPITALIST MARKETS, A PASSION FOR THE SPORT OF GOLF, AND A BELIEF THAT EACH OF US CAN CONTROL OUR INDIVIDUAL DESTINY, AND SHOULD BE ABLE TO ENJOY THE FRUITS OF HARD WORK, AND CALCULATED RISK TAKING. WHETHER OR NOT YOU HAVE EVER BOUGHT OR SOLD A STOCK, OR EVER PICKED UP A GOLF CLUB, I HOPE YOU WILL TAKE A FEW MINUTES TO EXPLORE OUR SITE. "NOW IS THE TIME - PUT DOWN YOUR FEARS - PLAY YOUR GAME", TAKE CONTROL OF YOUR OWN FINANCIAL DESTINY.